Varsity-A Boys volleyball beat Jordan this afternoon in the ADAL Championship at Blackford Gym, finishing in first place, the most recent triumph for middle and lower school athletes! Varsity-A tennis defeated Hillview 7-2 in the WBAL championship match this week. The team went undefeated for the fourth year in a row in the WBAL with a 5-0 record, and then won both their semifinal match vs. Sacred Heart 7-2 and their championship match vs. Hillview 7-2 to take the league title. Varsity-B (grades 7 and 8) girls volleyball, coached by Sarah Prudencio, finished undefeated at 7-0, taking first place in the WBAL South. Junior Varsity-A (grade 6) girls volleyball, coached by Vonda Reid, finished undefeated at 7-0, taking first place in the WBAL Gold Division. Junior Varsity-B1 (grade 5) girls volleyball, coached by Ellie Pereira, finished 5-1, tying with Sacred Heart for first place in the WBAL. Varsity-A (grade 7 and 8) boys volleyball, coached by Pete Anderson, went 10-0 in league and 11-0 overall, taking first place and the tournament championship in the ADAL. 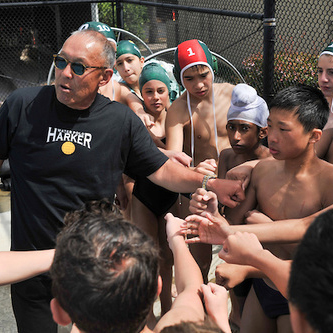 Co-ed water polo (grades 6-8), coached by Ted Ujifusa and Peter Blume, went 4-0 at the WBAL championships. Lower school track (grades 4 and 5), coached by Allison Burzio, Margaret Huntley, Kelcie Lai and Karriem Stinson, took first place at the WBAL track meet in the 4 X 100 grade 4 boys relay (Rohan Gorti, Andrew Fu, Lorenzo Martinelli and Rigo Gonzales) and first in the the 100, 200 and 400 (Rigo Gonzales). Middle school track (grades 6-8), coached by Allison Burzio, Margaret Huntley, Kelcie Lai and Karriem Stinson, took first place at the WBAL track meet in the 4 X 100 grade 8 girls relay (Alex Janssen, Sara Min, Alycia Cary and Julia Amick) and the 400 and 800 (Julia Amick) and the long jump (Alex Janssen).